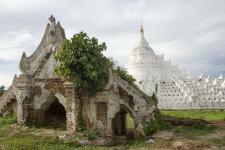 Across the Irrawaddy River from Mandalay is Mingun where the uncompleted dream of King Bodawpaya to build the biggest pagoda in the world is situated. 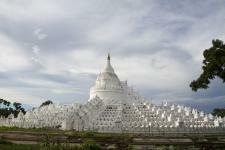 The remains of the gigantic, unfinished stupa are still extraordinary. Just within a short distance is another massive product of the king, the Mingun Bell, which is believed to be the largest working bell in the world. The kingÃ¢â‚¬â„¢s grandson, King Bagyidaw, also left an impressive sight for modern spectators to behold. The white Hsinbyume pagoda, modeled after the mythical Mount Neru, strays away from the usual pagoda structure with surging rails and mythological monsters standing guard at various points in the pagoda.